Played on January 1, 2018 at the Rose Bowl stadium in Pasadena, California, the 104th Rose Bowl Game is a semifinal for the College Football Playoff (CFP), matching two of the top four teams to compete for a spot at the 2018 College Football Playoff National Championship game. 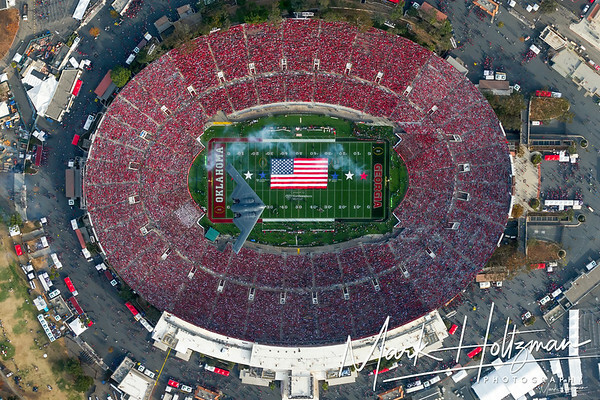 The 2018 Rose Bowl Game pit The University of Georgia Bulldogs against The University of Oklahoma Sooners. Hi. I noticed you are not selling the high resolution photos in digital copies, but I am interested in low-resolution version. Could you let me know how I could get that for a couple of these photos. Thanks so much! Hi Samu! Sorry but we are not selling high-resolution digital copies of this photo. I'd be happy to send you a low-resolution version though. Hi! Is it possible to buy a digital copy of this photo?